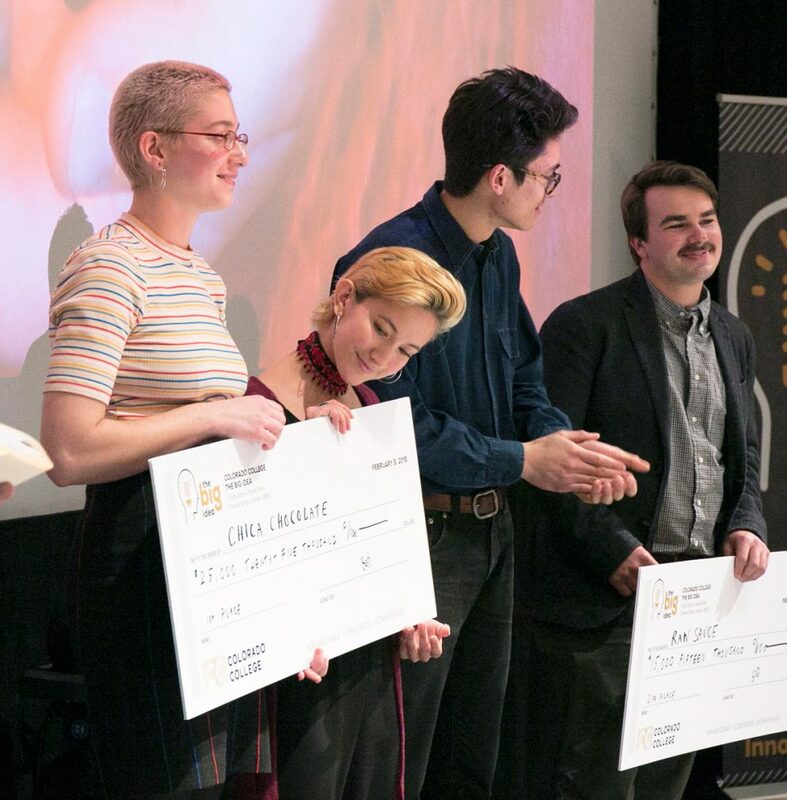 Chica Chocolate, which took second place in the Big Idea competition last year, returned to take first place and $25,000 in prize money at CC’s sixth annual Big Idea competition in February. The student pitch competition, with a total of $50,000 prize money at stake, is rapidly becoming one of CC’s signature events. Chica Chocolate consists of team members Cassidy Lam ’19 and Elise Morgan, a student at the University of Colorado Boulder. The company’s high-quality chocolate truffles are infused with a Chinese herbal formula designed to promote hormone balance during the menstrual cycle, and are delivered to customers on a subscription basis. Taking second place and netting $15,000 in seed money was Raw Sauce, led by Alex Harros ’18 and George Fowlkes ’18. Raw Sauce is a sustainable fermented foods business. In third place and receiving $10,000 in seed money was Momentics, led by Alana Aamodt ’18, Anna Gilbertson ’19, and Josie Eichers, a finance and international business student at the University of Minnesota. Momentics is an open-ended toy kit for children ages 8-12 that leverages the viral culture of Rube Goldberg machines by upcycling old toys to create chain-reaction machines. Also making it to the finals was LifExpectancy, an iPhone application that motivates people to live healthier lives, presented by Lauren Weiss ’21 and Jack Hamren ’18; and NOWZ, a universal event aggregation app that utilizes augmented reality to display and filter local events, presented by Deming Haines ’21, Charlie Kellogg ’21, and Case Regan ’21. Colorado College President Jill Tiefenthaler noted that in addition to three teams being led by female students, this year’s competition also featured two teams led by first-year students and had a wide representation of majors and disciplines.